Is this shirt clean? Where’s the coffee scoop? What should I pack for lunch? Do I need to stop and get gas before work? Did someone feed the dog? Mornings! So little time, so much to do. If you’re making a million decisions before you leave the house, you may be setting yourself up for a day of overspending. Why? It’s called decision fatigue. And it happens when you run around your house, making choice after choice until your head spins. By the time you arrive at work or get the kids off to school, you’re over it. You’re ready for easy. Maybe that means buying a coffee on the way to work when you have a bag of gourmet beans on the counter. Or maybe that means picking up pizza when you have plenty of groceries in your fridge. Whatever it is, you’re looking for convenience, not what your budget allows. Scientists have even documented this phenomenon. In a study by Case Western Reserve University researchers, participants were asked to eat only radishes instead of the freshly baked cookies in front of them. A luckier group of participants, however, got to chow down on the cookies. Afterward, both groups were asked to complete a secretly unsolvable puzzle. Guess who focused better on the task? The cookie eaters! It seems the radish eaters were so tuckered out with self-control that they gave up on the puzzle twice as fast. No, this doesn’t mean that eating cookies makes you smarter—although that would be awesome. It means that exerting all your willpower early in the day is exhausting. And it’s easier to say to heck with it when it comes to budgeting decisions later. 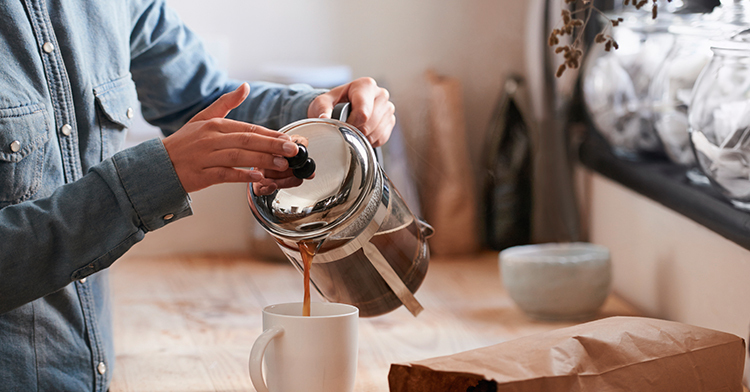 There are lots of small ways you can set your mornings up for big success. And they all start with some simple pre-planning. The Closet Shuffle. You’ve heard of picking out your clothes the night before. But what if you took it a step further and picked out your clothes for the entire week? Simply clear a small section of your closet and arrange your outfits accordingly. Then all you have to think about in the mornings is your shoes and accessories. Yeah, you’re a trendsetter. The Brown-Bag Quick-Grab. If you’re planning to pack your lunches every day, do it after dinner. During meal cleanup each night, box up some leftovers and stick them in the fridge next to an apple or a simple Mason-jar salad. Come morning, you can grab it quickly and go. The Coffee Pot Roundup. Don’t have an auto-grind coffee maker? No worries! Just grind your beans and measure your water the night before. Maybe do it during a commercial break or before you turn off the lights for the night. It takes all of three minutes, but it can set you back 30 minutes in the morning (or at least it feels that way). Pre-set it and forget it. By having a morning routine in place, you will eliminate the risk of entering decision fatigue early in the day. Save your willpower for more important decisions, like whether or not to spend money. Create a budget that makes it easy to know what you have left to spend each day. It's free, and it only takes 10 minutes with EveryDollar.